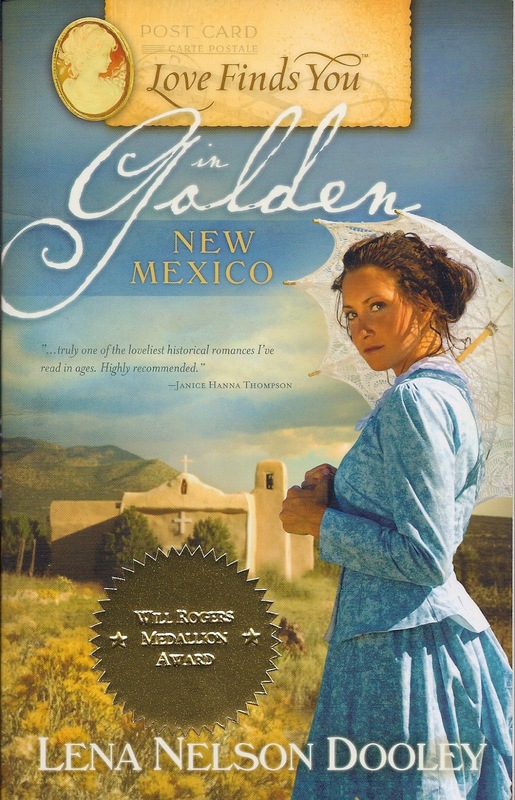 My novel Love Finds You in Golden, New Mexico, which won the Will Rogers Medallion Award for Excellence in Western Media for Fiction, was largely set in Golden, New Mexico. The first gold strike west of the Missippi was in Golden, New Mexico, even before the strikes in Colorado and California. Although none of the book takes place in the mines, I still had to do a lot of research about gold mining. And Angus McKenna, the father of the identical triplets in my McKenna's Daughters series, was headed to the gold fields when he and his wife joined the wagon train on the Oregon Trail. After gold was discovered at Sutter's Mill in California in 1849, many would-be miners made their way across country by wagon train while others sailed nine months from the Eastern US, around the tip of South America to the western shores of California. Both ways to get there were hard and fraught with many dangers. Some miners even braved the mosquito infested Isthmus of Panama to get to the other side of our country. The 49ers, as the miners were called, had to be a hardy lot. And after they arrived, many of them never found a speck of gold. Others, however, quickly became extremely wealthy. I know a lady in Oregon, whose family wealth came from the early gold mines. At first the gold fields were a lawless wilderness, but before many years, law-abiding citizens banded together to spell out the laws. They hoped to calm down much of wanton violence and greed. In many places, they were successful. In others, not so much. Another group of people on the gold fields were those like Angus McKenna. He went to the gold fields, not to prospect for the yellow mineral, but to sell the miners what they needed. Drinking water was at a premium. 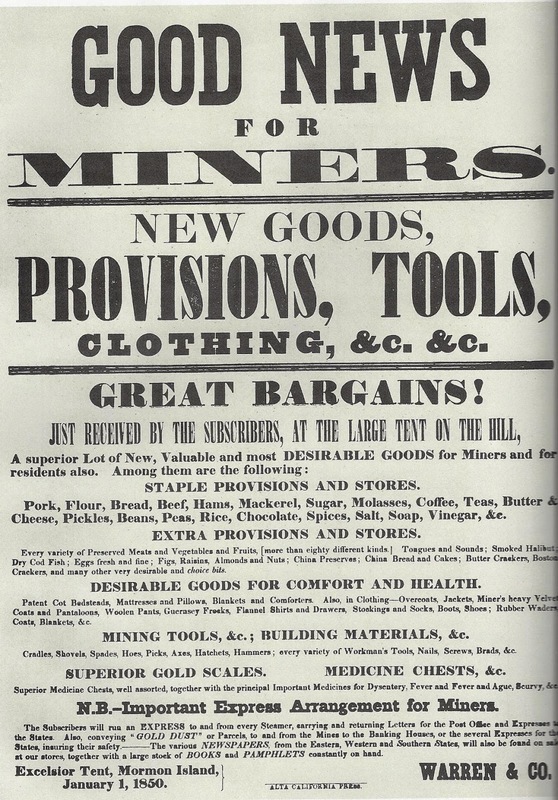 Basic mining tools, clothing, food, and other essentials were the gold the storekeepers provided the miners, saloons, and eventually families that settled there. Notices like this one brought miners thronging to the tent stores. Some unscrupulous men started saloons and even brothels. But many miners just yearned for a decent women. When these women began arriving at the camp-like towns, the ratio to men to women was at least twelve men to one women. So they vied with each other for her hand. Often they were met by a number of miners who each offered a gift of gold dust that amounted to about $200 to the woman. Word reached civilized towns, and many a lonely and poor woman went to see what was going on. A term coined during that time is still in use today, gold digger, which means a woman who is only interested in a man who has money. Actually, in my book, Love Finds You in Golden, New Mexico, the hero is convinced that the heroine is a gold digger, and he tries to save his friend from her. Today, I'm going to give away a copy of that book to someone who leaves a comment. The winner will be announced tomorrow in the comments, so check back. And I'd love for you to check out my McKenna's Daughter series as well. I love to hear from my readers. You can find me on Facebook, on my website www.lenanelsondooley.com, and on other social media sites. Lena, I didn't realize gold was discovered in New Mexico before California and Colorado. What great history. I can only imagine how tempting it would be for some poor, unmarried woman to be met by men offering money for marriage. Interesting thought. Thanks for sharing. Thanks for stopping by, Nancy. I found a lot of interesting things about that time period. Interesting! I can imagine being a poor woman without anyone to take care of her, being independent and doing this. I once was niave enough to believe that any two people could live together. I found out differently when I married a man that I had only exchanged letters and telephone calls with, after one visit. I found that people can present themselves in a light where you are attracted to them, and can actually turn out to be quite different when you live with them. Thanks for stopping by, Robin. I think you'll like Love Finds You in Golden, New Mexico. Thanks for dropping by, Maxie. I'm glad you like my books. You'll definitely be in the drawing. I love stories set in he 1800's. You are also a new author for me and I look forward to reading your books. I will definitely be looking for the McKenna series. Thank you for the chance to win. Thanks for dropping by, Dorie. I would love to have you join the ranks of fans of Lena Nelson Dooley's books. Thanks for stopping by, Eliza. There are a lot of interesting stories set in the late 1800s, mine included. Just finished reading Maggie's journey! Lovely story, Lena. So descriptive and well-researched. Lena, just reading all your information has made me want to run out and buy your book. It sounds very interesting. Hi Lena! Your LFY in Golden sounds super cute - thanks for the chance to win a copy! I don't know where I though the term gold digger came from but it certainly wasn't what you just shared! Thanks for a great post!! I will be looking out for your books, I enjoy period set novels a lot. And I see you have a series also, even better. If you have not drawn the winner yet, I'd live to be included in the draw. I have to apologize to all of you. I didn't find a winner for this book until today. My last 8 days have been very hectic. But here I am, and the winner is: Eliza Elliott. I'll send you an email today.